The Nesco 4815-12 is a 5 Quart roaster that comes with cool touch handles and is convenient in size to be used by a small family. It is ideal for making a batch of chili, soup and stews. The roaster features a removable chrome-plated roasting/ baking rack. This porcelain cookware is designed to roast, bake, cook, steam, slow cook and serves all in one. The extra high-domed, self blasting cover helps to retain moisture thus making it a perfect choice for your kitchen. The Nesco 4815-12 has many exciting features for users of all types. See the Nesco 4815-12 gallery images above for more product views. 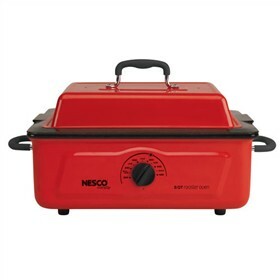 The Nesco 4815-12 is sold as a Brand New Unopened Item.